SUGAR LAND, TX (June 11, 2018) — Tyumen Service Geophysical Company (TSGC), headquartered in Tyumen, Russia, and Wireless Seismic, Inc. (WSI), headquartered in Sugar Land, Texas, are pleased to announce the successful completion of a large-scale, 3D seismic survey, using WSI’s RT2 real-time and cable-free seismic acquisition system, in the Megon region of West Siberia in Russia. 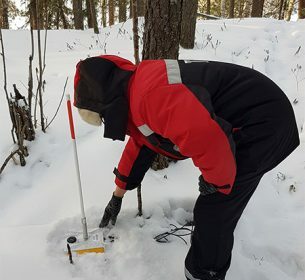 A dynamite energy source was used for the survey covering 230 square kilometers during harsh winter weather conditions, with typical temperatures below -30°C and peaking to -50°C. RT2 performed very well and delivered comparable data to the legacy cabled telemetry system used in addition to the RT2 for the survey. Since the acquisition project was part of Gazprom Neft’s ongoing “green initiative” program, the RT2 system represented a significantly lower environmental footprint when compared to the legacy cabled system. In addition to the lack of telemetry cables, the added efficiencies of RT2 were very much appreciated by TSGC, including the real-time data return and the fully interactive control of the seismic spread, features not available in other cable-free technologies. TSGC, based in Tyumen, Russia, has been providing services of conducting field seismic operations using the 2D / 3D method since 2008. Over this period, more than 6,530 kilometers of 2D and more than 5,640 square kilometers of 3D surveys have been completed in the Tyumen region. Wireless Seismic is revolutionizing onshore seismic data acquisition by delivering the industry’s only fully scalable wireless seismic recording systems with real-time data transmission. Headquartered in Sugar Land, Texas, the company’s recording systems enable contractors to efficiently tackle the most challenging seismic projects by delivering commercially compelling solutions for conventional surveys and passive monitoring projects.